Sometimes thinking is hard. We do a lot of it all week, and frankly, it’s exhausting, which is why we love it when somewhere takes it off our hands. Enter Sir Allen Taylor & Co, Darlinghurst’s versatile new café-come-cocktail bar: a total godsend for indecisive and slightly scatty peeps (like us) looking for somewhere they can reliably rock up to anytime, and know it’s going to be the perfect place. 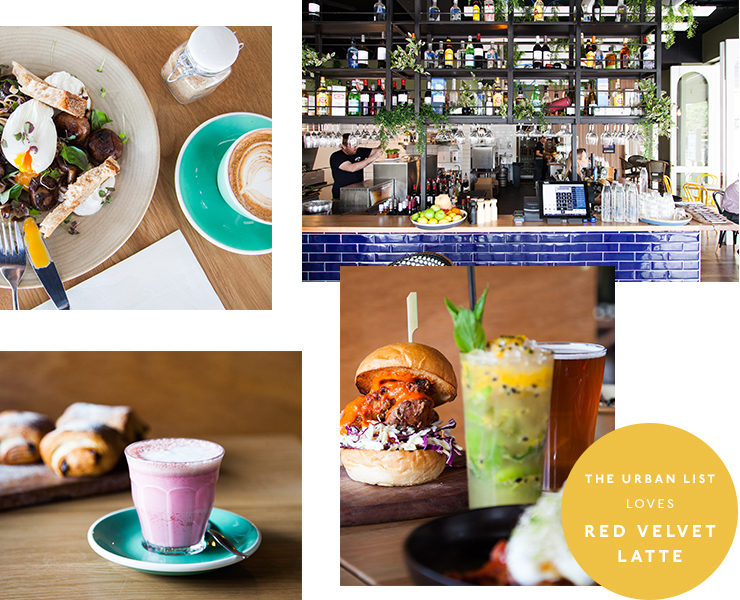 The lovechild of owner, Sydney hospo guns Benny Sweeten and Shirin Topaloglu's two latest venues—café Kansas City Shuffle, and dapper dedicated espresso martini bar Tuxedo—it sits on a buzzing corner spot of Oxford Street overlooking Taylor Square. Named after (you guessed it) Sir Allen Taylor (a Sydney mayor of yesteryear and Taylor Square’s namesake, who was all about jzujzing up the design of Darlinghurst including the creation of the square itself) and the place is definitely giving him the props he deserves. With its monochrome palette smattered with pops of greenery and vivid colours reflecting the vibrant local life, and its massive windows bringing a tonne of natural light and an excellent vantage point for Oxford Street people-watching, this place is Sydney to a tee. And Sir Allen Taylor knows what Sydneysiders need, when they need it, from its early-morning coffee kiosk right through to late-night hangs. Food-wise, it’s an all-day-brunch-style menu, with all your expected faves like smashed avo and superfood granola done impeccably, plus the type of inventive and delicious dishes you’ll be familiar with if you’ve eaten at Kansas City Shuffle. In fact, in bloody epic news, Kansas’ legendary hickory smoked brisket and waffles are on the menu at Sir Allen, and they’re a must-try: the rich and tender brisket on these bad boys melts in your mouth, and the chilli butter gives the perfect warmth. Oh and if crepes give you life (yep, us too) the ones you’ll find here are straight-up ridic: the savoury incarnation is laced with lentils, lime labne and candied chilli cashews; the sweet, a Tahitian vanilla crepe with lemon crème fraiche, blueberry compote, roasted pistachios and mandarin sugar. #Drool. We’re also big fans of the medley of mushrooms—perfect, juicy button mushrooms and delicate enokis nestled into whipped feta with perfectly poached eggs and crusty rye—and the leek and potato croquettes with slow-cooked tomato and chorizo ragu are basically to die for. Everything is either made in-house or comes from local suppliers, and you can totally tell. After 3pm the venue and menu switch into bar mode, serving mains (hello, Young Henry's beer battered fish 'n' chips) plus bar snacks borrowed from Tuxedo’s menu. The bio-dynamic pumpkin arancini, pulled beef sliders and even little warm apple pie pillows are easy finger food that lets you keep a hand free for your all-important drink. Because, of course, we’re here for the drinks just as much as the eats. The coffee cart out front churns out faultless brews, along with a traffic-lit array of matcha, golden and red velvet specialty lattes (which taste like a liquid red velvet cupcake—for real). But cocktails are on from 10am, so if you’re up for a boozy brunch, or just a cheeky hair of the dog to go with your hangover feed, this is the place. Sweeten’s crew obvs know their espresso martinis and have brought five killer incarnations of some of the best in town to Sir Allen: were talking salted caramel, jaffa, deluxe versions and more. When you’re sufficiently caffeinated, decaf versions are available, otherwise the rest of the lush, summery concoctions like peach bellinis, or Sir Allen’s Fruity Punch are the perfect refreshers to see you through the day and late into the night. Sir Allen Taylor & Co is a total showcase of hospo experience done with style. 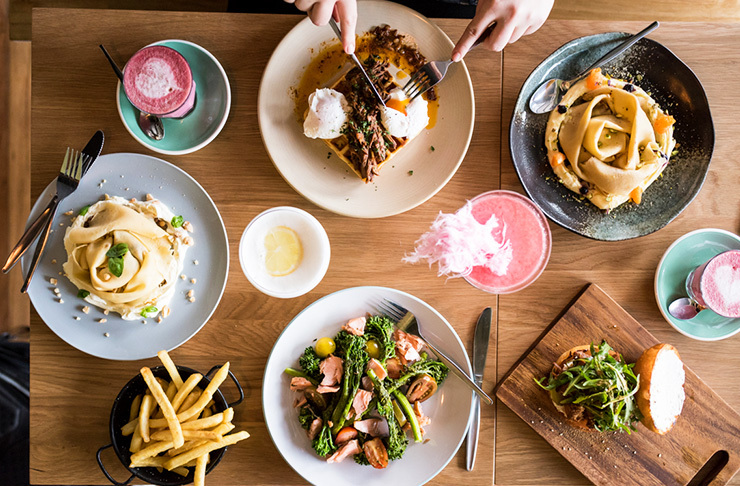 Whether you’re an early bird or late riser, a healthy bruncher or a bar snack grazer, or you like your caffeine in milky or boozy form, Sir Allen Taylor is one of our fave new spots we never knew we needed. Editor's note: this article was produced in partnership with Sir Allen Taylor & Co. Thank for supporting the sponsors who make The Urban List possible. For more information on our editorial policy, click here.